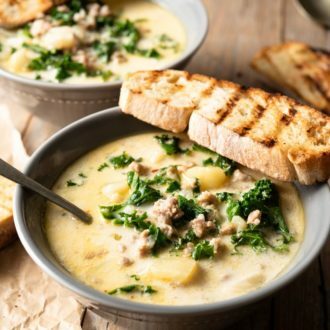 This easy Zuppa Toscana Soup is inspired by the version served at Olive Garden. 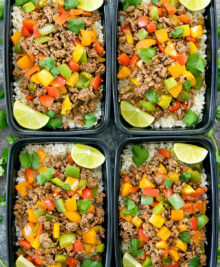 It’s flavorful, hearty and comforting. During my college years, I was a frequent Olive Garden customer. And like many others, I was there mainly for the zuppa toscana soup and breadsticks. 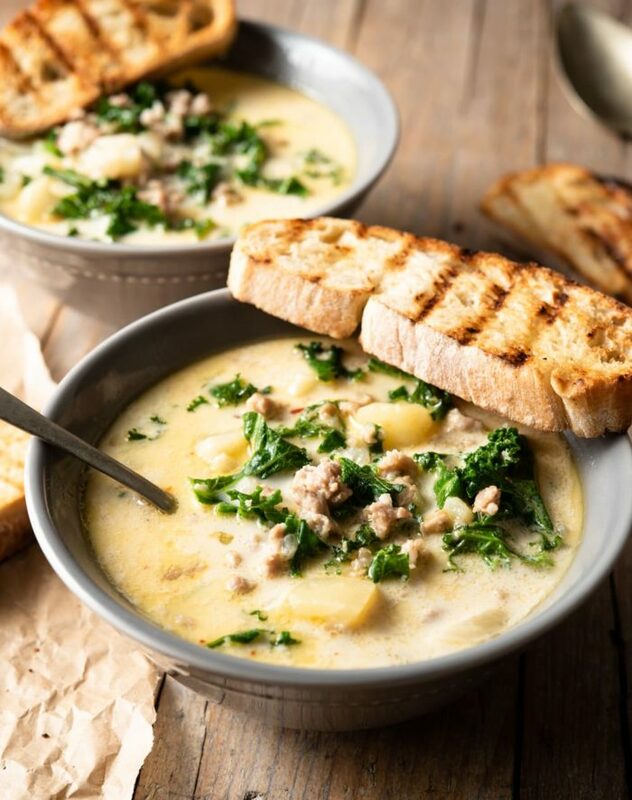 It’s been many years since I last visited Olive Garden, but I still love zuppa toscana soup and luckily it is something that I can easily make at home. I used chicken bouillon cubes with water to create the soup base. However, you can also substitute with chicken broth or chicken bone broth. 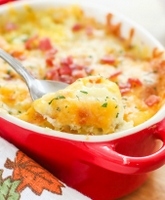 The soup can easily be made low carb by removing the potatoes. I love serving my soup with crusty bread. 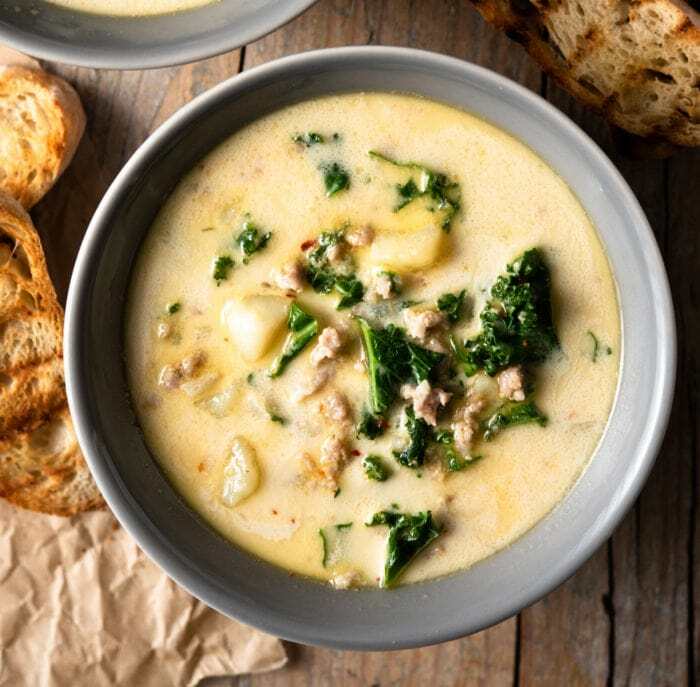 However, if you are trying to keep things low carb, I recommend serving this soup with my low carb keto biscuits, low carb breadsticks or low carb mug bread. 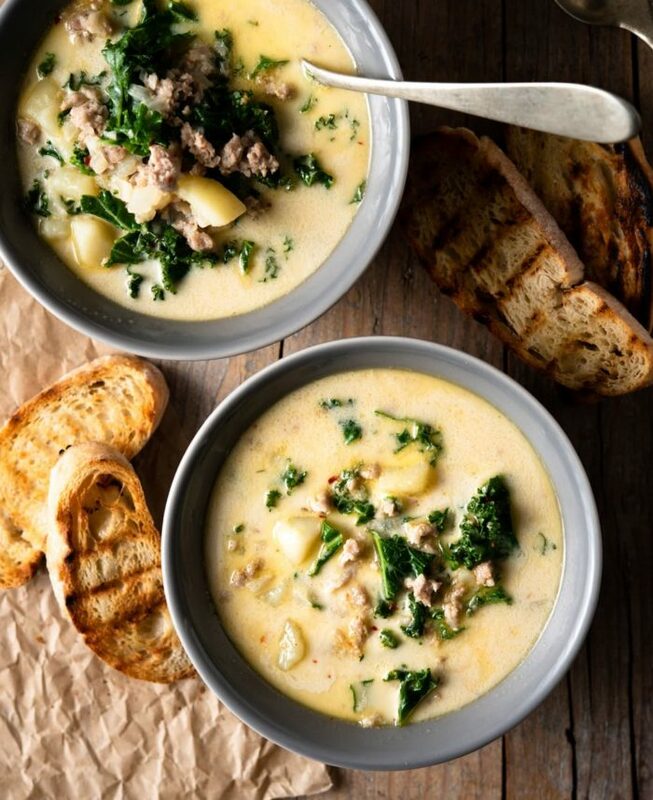 This Toscano soup is my copycat version of the one served at The Olive Garden. Cook and crumble sausage in soup pot until it is fully cooked. Remove sausage and set aside. Drain out oil but leave behind about 1 tbsp. Add in diced onions and saute. Once onions are translucent, add in garlic and cook another minute. Add in water, chicken cubes and potatoes and bring to medium-high heat to bring soup to a boil. 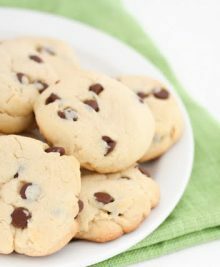 Reduce heat to a simmer and cook until potatoes are soft, about 15-20 minutes. Keep lid on so that water does not evaporate. Reduce heat to low and add in heavy cream, kale, sausage and red pepper flakes and cook until kale is just tender. Serve warm.